Slash filter windrows are structures made out of waste logs and compacted slash. They protect forest streams from sediment originating on road surfaces and fill slopes, stabilize road fills, and help prevent stream sedimentation during road construction. Windrows can be constructed on both sides of a road or on just one side, depending on the type of road and surrounding topography. Slash filter windrows should not substitute for right-of-way slash disposal: normally only a small part of right-of-way debris and slash is used in windrows. As you clear the right-of-way, stockpile tree tops, limbs, brush not exceeding 6 inches in diameter, and cull logs at least 18 inches in diameter. Cull logs should be approximately 12 feet long; they will be used as anchors. Stockpile material either above or below the clearing limits. Piles should be at locations that provide the best access for constructing the windrows after road grade excavation and shaping is completed. Windrow length should extend no more than 300 to 400 feet each way from a stream crossing unless the road parallels the stream. If the windrow extends more than 400 feet, it is advisable to leave wildlife corridors every 200 feet. 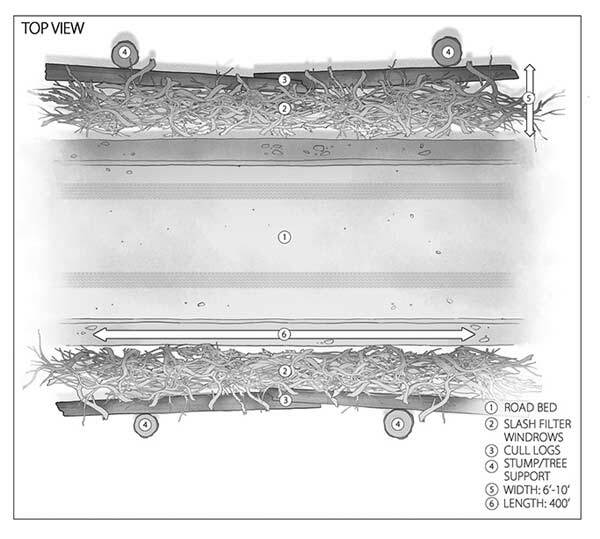 After fill construction is completed, construct the windrow using an excavator. Start by placing anchor logs just at or below the toe of the fill. Anchor these logs against stumps, rocks, or trees parallel to the fill toe line. Continue to use the excavator to pack slash by tamping above and along the length of the anchor logs. 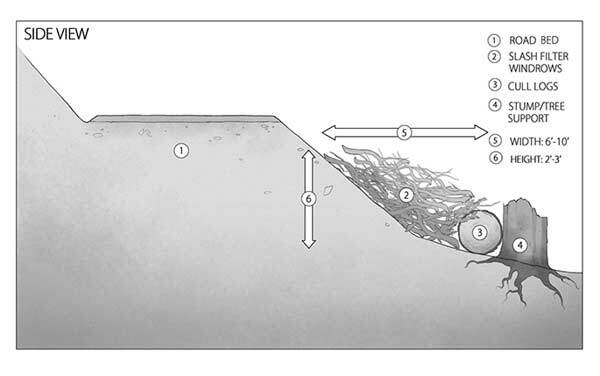 Embed the slash in the fill slope in quantities sufficient to make a sediment-impervious windrow 2 to 3 feet high and 6 to 10 feet wide.